EVERYONE will want to visit you in this 4 bed, 3 bath cottage with its deep porches and fabulous views. 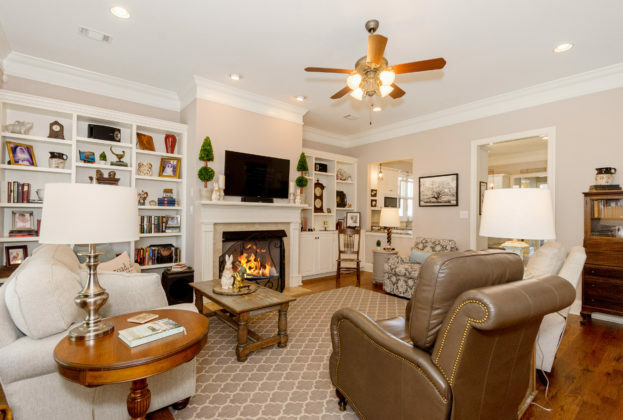 The front porch may draw you in, but the comfortable living areas, remodeled kitchen, sun porch and back porch may make it hard for your guests to leave! Gleaming hardwood floors, tall ceilings, plantation shutters, and beautiful moldings adorn the 1st floor. Relax in front of the fire or curl up with a book in your living room. Mornings are spent on the sunporch or back porch with views of 200 acre Lake Cameron. Cooking and entertaining in your remodeled kitchen is a pleasure with its roomy island, deep pantry and extra cabinets and counters. The recent kitchen remodel included new granite countertops, double wall ovens, farmhouse sink, disposal and flooring. The owners’ suite features two closets, double vanities – one with knee space, deep jetted tub and separate tiled shower. The 1st floor guest suite is tucked away and includes an accessible bath with a wide doorway and walk-in shower. Upstairs are 2 guest bedrooms and a full bath. The property features WONDERFUL storage with 3 extra closets on the 2nd floor PLUS walk-in attic storage. Outside, there is storage under the back porch, in an enclosed space under the house and in the 2 car garage and its attic. There is parking for 2 more on a carport and parking pad. Irrigated and fully fenced, the backyard is perfect for pets and children. You MUST see this property to appreciate it. The kitchen and baths were partially remodeled in 2015. The house has recently been painted and the geothermal HVAC unit upstairs and water heater were replaced in 2016. Vacation at home right here in Pike Road. World class fishing, boating, swimming, tennis, kayaking, canoeing, and other sports abound. 2.5 miles off I-85, Exit 16 & less than 15 min. to Montgomery’s EastChase Shops. Contact Pike Road School (334-420-5310) to verify schools & zoning. ** Verify schools. 12th grade is still part of Montgomery County School System.